I just got home from Savannah last night, and I’m already missing everyone terribly. The four days I spent there at IxDA’s Interaction10, their third annual conference, was one of the best conference experiences I’ve ever had (and as you may know, I go to a lot of conferences!). 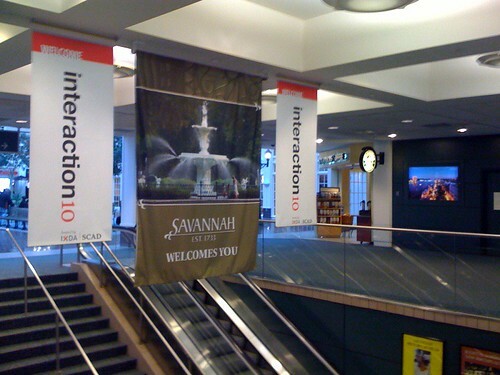 Not only is Savannah a wonderfully beautiful, slow-paced, historic, elegant town, that on the whole pays extraordinary attention to customer service — the experience of the conference itself was designed to a tee. This has been the case with the past two Interaction conferences as well, but something was missing last year when it was held in Vancouver. I loved the city, but the conference was held in two hotels, and didn’t have the same flourishes that I have come to expect from the Interaction Design Association (IxDA). 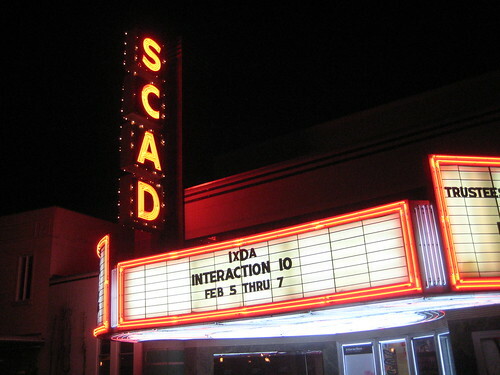 This year, back in Savannah (the inaugural conference was held here), the spirit of the community was at an all-time high. I went into it knowing I would be inspired by the sessions and excited to spend time with old friends, but I never expected that I would meet so many new people (some whom I knew from afar and some I had not yet heard of). It finally occurred to me that the size of this “community” that I speak of so often is actually infinite. There is no boundary around us. We are always expanding, always moving into new corners, absorbing other practices, and finding people who are just starting to identify themselves. It’s so thrilling to know that we can never possibly all meet each other, that there’s always going to be someone new out there to teach us something we never knew, make us think in ways we haven’t considered, and generally elevate the visibility of our profession to the world. As usual I captured the moments that meant the most to me via Twitter. I hope you enjoy living vicariously through the notes (or reliving, as the case may be). Only one thing wrong with my beautiful hotel room at the quaint Planters Inn: no desk. That’s ok though cuz I prefer my lap. Bummed that it’s so cold and windy in Savannah today. What’s a good place to go that’s indoors? If you’re at #ixd10 and have a cartoonish avatar, please change it temporarily to your real photo so people can spot you and say hello! Downloading my first ever app to my iPod Touch…the IxDA Interaction10 app of course! That’s who I had a great dinner with tonight at Ruan Thai! Now we’re off to Moon River for beeeer. I really wish there were power outlets around the theater. Nathan Shedroff is giving the opening keynote. Is he not on Twitter? …justice, oneness, redemption, security, truth, validation and wonder. But everyone prioritizes them differently. What are the top 5 means for your organization? Ideally you should be doing research to find this out. And what about for yourself? 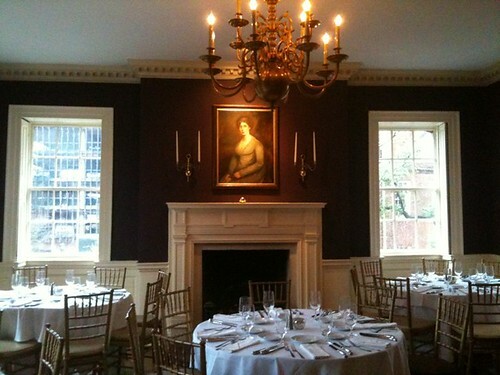 What’s the deal with wi-fi in The Olde Pink House ballroom? Present = involves the audience. Detectable = requires no prior knowledge. Responsive = defines parameters in the moment. The slew of doctors that helped Luca over the course of the year is incredible, but there were other folks who aided in the process..
6) Admit to mistakes, and learn from them. Be honest about where you went wrong. What are you going to do better next time? 7) It’s ok to say, “I don’t know.” Because when you do know, it will give people a lot more confidence in your answers. Can someone explain how tonight’s festivities have changed? Sounded like what’s already on the schedule. Manzini is talking about interaction design as social service design, right? Can we agree now that they’re the same thing? RFID waves are invisible, but how might we start thinking of it as and working with it as a design material? Nike data being sent to Twitter creates an immediate satisfaction that validates and encourages your behavior. Augmented Reality term invented 18 years ago by Tom Caudell at Boeing. It’s mixed-reality (live and not), not virtual reality. @k asks, why if AR has been around for a while are we paying attention to it now? Camera phones more prevalent, better connectivity..
@k quotes William Gibson “The future is already here; it’s just not evenly distributed” Groans from the audience. But isn’t he right? Damn, I’m late to @livlab‘s talk Ceci N’est Pas Une KPI. Live-Twittering starts now! Numbers help us define where we are, not what we need to do — that’s design research. I love numbers and I love that @livlab talked about numbers and I love @livlab! @livlab is launching into her UX Health Check and I’m realizing this should be its own talk. People are hungry for this analysis! “This is the Tamagotchi. I hate the Tamagotchi.” — Paola Antonelli Why? Because 2 months after her brother’s died, he died. Woah. Wow, such great photos coming across the screen from Paola Antonelli, but I can’t possibly capture them all. I really liked what Paola had to say. It wasn’t revolutionary, but it was a new frame of the subject, succinct, and well illustrated! … @alexislloyd @dantemurphy @elimalone @jonesabi @hilaryue That’s who we had dinner with! Day 3 is starting now with @cchastain‘s Thinking Like a Storyteller. Go Cindy! Most importantly, there are *self-narratives* — the stories users tell themselves as their using a product. How do we optimize it? What can we learn from the *discipline* of storytelling that will help us design for more meaningful & engaging product experiences? Plot: to understand a film’s story is to grasp what happens & where, when & why it happens. Are we being clear about those elements? @emenel showing a mental model he created. It’s not the work behind these that scares me, it’s the production work. Share a template? Endless congratulations go to the co-organizers Bill DeRouchey and Jennifer Bove, Samantha Soma, Will Evans, Todd Zaki Warfel, Dave Malouf, Jonathan “Yoni” Knoll, and the endless other volunteers who made this wonderful conference happen. Thank you for your tireless efforts and desire to create a special experience for us. I agree, this was one of the best conferences around. And the community is a big part of that – very open, intelligent, and friendly. Thanks for the summary and insights. See you in Boulder! Thanks, Whitney. Glad you enjoyed the conference. It was a pleasure listening to all the conversations and hearing people talk about how much the enjoyed the experience. It was also great so see people using some of the tools we designed to make the conference experience better, like the badge and wayfinding tools. I'll be writing a series on my blog on the experience behind designing the experience of interaction10. Then I will certainly be blogging about that as well. Can't wait to read it! I agree Whitney. I wonder how much of Twitter and Crowdvine played into the experience. I feel like we created a tight community before we even attended the conference. Can't wait to read Todd's blog.